An Apple patent application published on Thursday shows the company is investigating illuminated touchpad technology extended from research done on the legacy iPod's touch wheel, possibly for use in its MacBook line of laptops or a peripheral device like the Magic Trackpad. 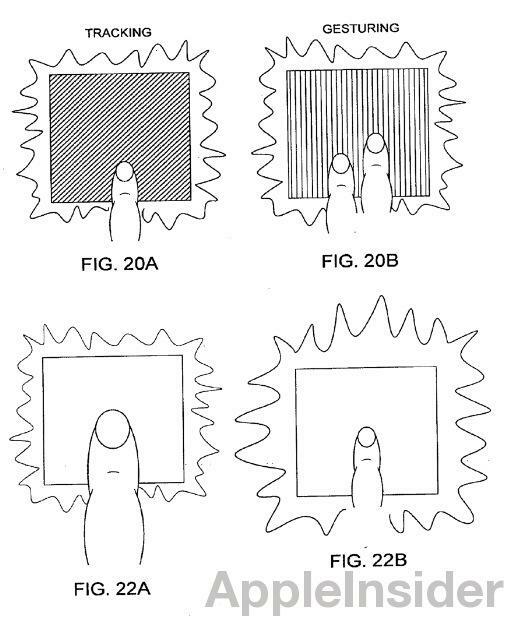 The patent, filed for in April and published on Thursday, is aptly titled "Illuminated Touchpad" and describes an "improved feedback mechanism" for the touch-sensitive input technology, one aspect of which relates to illuminating the surface of a touchpad device in relation to a user's finger movements. 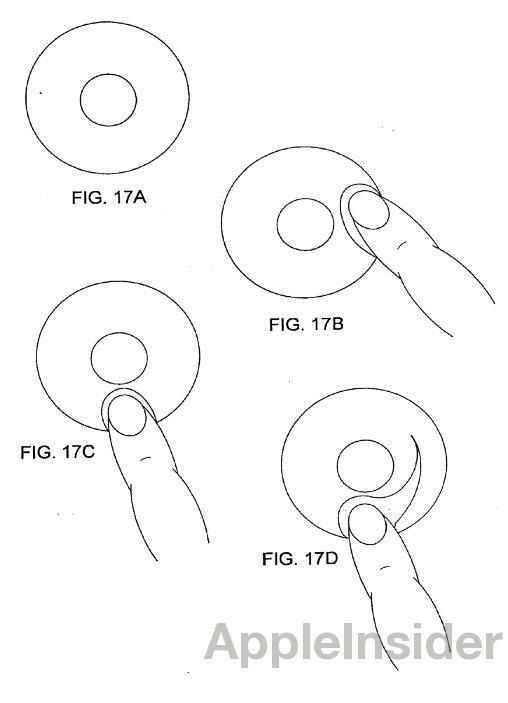 It can be gathered from the patent illustrations that the idea was perhaps originally meant to be used in an iteration of the touch sensitive scroll wheel-toting iPod, but the filing date suggests Apple is continuing work on the technology. 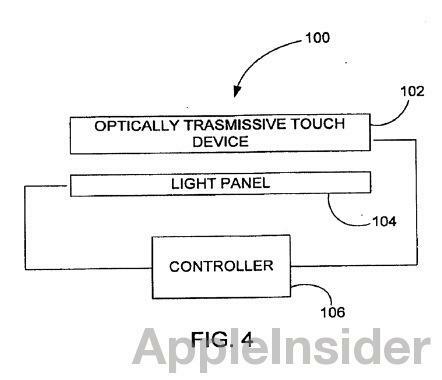 Apple's patent application is a continuation of a separate filing for a "Touch pad with feedback," and is related to a number of multitouch and touchpad innovations. In the patent description, Apple points out the technology is not meant merely as a backlight to find the touchpad in a dark environment, but instead aims to "give other feedback related to how the touch pad is being used." For example, an illumination point follows a user's finger as it moves across the touch sensitive surface and can change color or brightness dynamically according to gestures or input pressure. Touch pads typically include an opaque touch panel, a controller and a software driver. The touch panel registers touch events and sends these signals to the controller. The controller processes these signals and sends the data to the computer system. The software driver translates the touch events into computer events. Although touch pads work well, improvements to their form feel and functionality are desired. By way of example, it may be desirable to provide visual stimuli at the touch pad so that a user can better operate the touch pad. For example, the visual stimuli may be used (among others) to alert a user when the touch pad is registering a touch, alert a user where the touch is occurring on the touch pad, provide feedback related to the touch event, indicate the state of the touch pad, and/or the like. 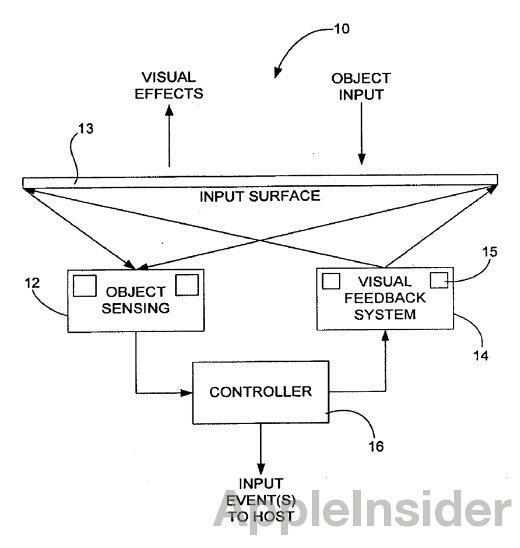 Apple notes that a wide array of embodiments are covered by the proposed patent, including devices that give feedback to user gestures which could be helpful in a number of computing situations. One example points out that illumination can occur before or after a touch event has been recorded, meaning a visual effect can begin before a touch event occurs, thus inviting a user to touch the lit area. Conversely, the area where a user just touched may remain illuminated well after the touch event, leaving a kind of marker on the device's surface. This embodiment also gives rise to visual effects of having a "leading" or "trailing" edge in regard to where a user's finger has been or where it is going. As for the construction of the touchpad, the patent calls for a wide variety of solutions like existing capacitive touchscreen technology. Powering the illumination would be cheap and efficient LEDs arranged in simple patterns to more complex configurations which allow for more accurate feedback. Because the low-power units would run cool, they can be placed directly beneath a touchpad. Light distribution would be handled by LED arrangement or through diffusing methods. Light pipes placed away from the touch sensitive surface are also mentioned as a viable option. Alternatively, the visual feedback system may be a graphically based system that generates graphics at the input surface. LCDs, OLEDs and electronic inks are examples of graphically based systems. These devices however can be cost prohibitive and more complex to implement when compared to light based systems. Besides the input feedback solutions mentiioned above, Apple notes the illuminated touch pad can be configured to "ebb in and out" when a computer is in sleep mode, much like the small white status LED on current MacBooks. A final embodiment suggests the touchpad can be used as a timer or clock as well as a user interface for a media player. It remains unclear if Apple will one day use the described technology in a consumer product, but the company has recently rolled out a number of cutting edge input devices including the multitouch Magic Mouse. 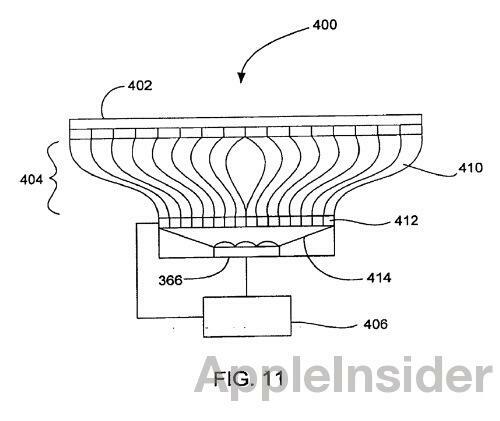 Apple already introduced glass trackpads across its MacBook line of computers, the first being implemented in the 2008 unibody MacBook Pro, as well as the Magic Trackpad peripheral, making implementation of this specific patent seemingly more feasible.